Vous souhaitez poser une question à l'établissement Hip Inn Coffee ? Durant votre séjour à Phitsanulok, vous vous sentirez parfaitement bien au Hip Inn Coffee, dont les chambres et le service sont d'une qualité hors pair. Situé à de l'animation de la ville, cet établissement 3 étoiles jouit d'un excellent emplacement et permet d'accéder aux principales attractions touristiques de la ville. Avec les principaux sites de la ville, dont Sgt. Maj. Thawee Folk Museum, Hôpital Buddhachinaraj, Parcours de golf Dongpukurd, à proximité de l'établissement, les clients vont adorer cet emplacement. À travers ses services de qualité et un vaste éventail d'équipements, le Hip Inn Coffee s'attache à rendre votre séjour aussi agréable que possible. Afin d'assurer un confort optimal à ses clients, l'établissement propose, entre autres, WiFi gratuit dans toutes les chambres, WiFi dans les espaces communs, restaurant, café. Toutes les chambres ont été conçues pour le plus grand confort des hôtes. La plupart d'entre elles disposent même d'une gamme d'équipements tels que chambres non-fumeurs, climatisation, télévision, télévision câble/satellite, réfrigérateur, et bien plus encore, qui satisferont les clients les plus exigeants. Que ce soit pour une session quotidienne de fitness ou pour un moment de détente après une longue journée, vous pourrez profiter de superbes équipements de loisirs tels que massage. De superbes équipements et un excellent emplacement font du Hip Inn Coffee le point d'ancrage idéal d'un séjour à Phitsanulok. Quelques chambres au dessus d'un café pas très loin de l'aéroport.Après avoir traversé des couloirs étroits,on découvre une grande chambre étonnante,déco "Marilyn",chambre très bien équipée:clim,wifi,produits de toilette,chaussons,grand lit et bon petit déjeuner pour un petit prix. Notre chambre était située au 4e étage. Sans ascenseur avec la chaleur de l'après-midi, l'accès est difficile avec le pack sac. un séjour atypique dans un hôtel étonnant et une chambre rose bonbon, dépaysement garanti. Hip Inn Coffee has stylish rooms at budget prices. Staff is very friendly and the coffee shop on the ground floor serves delicious coffee. The vintage decoration in the shop and on the hotel floors are worth a look! 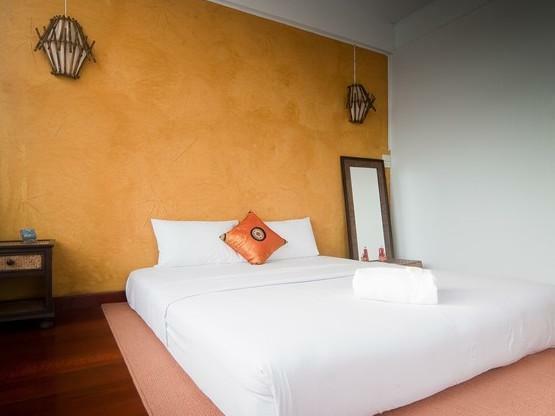 Easy access to airport and within walking distance to the Folk Museum and Buddha Casting Workshop. City center and nightspots are a little farther away. Great hotel, great coffee and strong wifi around. What more can you ask for. Besides, there was even a computer in my room. Quiet location. 5 mins away from train or bus stations by taxi (around 50 baht). Nice hotel with a retro look. Big room with good bathroom. Service is excellent, great vaule. the hotel location is convenience, there are many restaurants, pubs and bars around the area with short distance walk. it is great value to stay, however it is suitable for young couple or even for family, but not for older people since the hotel has no elevator. other than that i would highly recommend the hotel and definately would be back there. When I came to the hotel in early evening, it was closed. No information, nobody answers phone calls. I wasn’t sure if I have a place to spend night. Good I went to another place first, where had meeting and could come back later. Finally I was contacted by hotel owner, who was sorry and invited me to come to the hotel. WiFi didn’t work in the evening, it was working ok in the morning only. Even turning on TV wasn’t so obvious. Room and corridors were clean so-so. I would give positive opinion for nice maid and hotel owner, who wanted to help. American breakfast was good. Enjoyed my brief stay upstairs from a coffee shop. The room was very comfortable. No major issues but it seems not many foreigners stay as English was not used. The breakfast was ok but disappointed. Coffee great as you would expect from a coffee shop. The staff were very pleasant. Always made me feel welcome. The rooms are really lovely and the coffee downstairs is a perfect place to relax. The coffee and the breakfast is really good too. Although little English is spoken, the staff is so nice and helpful that the language barriers were no problem at all. The room was not exactly the one described by other comments. It s not quiet at all as it is on the main road to the airport. The bed is on the ground and the toilet is open to the bed room, so if you are not alone, forget about privacy. Decoration is nice but very basic. We had to change hotel and I would go back there only for coffee and good internet. The rooms and coffee shop! this place was probably our favourite hotel in thailand. the room we stayed in was very modern, clean and would even say flash. the coffee shop downstairs was delicious and the staff were ridiculously helpfull even though they didn't speak english very well, but that didn't matter because they tried there hardest to help in anyway possible. the breakfast was delicious (eggs, toast, ham, sausage, coffee) and because we don't eat meat they insisted we have more toast and coffee for free. it's a shame that this place is in phitsanalouk as there is not much to do here. if you find yourself stuck for things to do, visit the big shopping centre with the tesco lotus a bit out of town. i would stay here again for sure it was awesome! our room was comfortable, clean, with decent bed, good shower, and good wifi reception. the hotel staff spoke acceptable english and were helpful. the downstairs coffee shop has an excellent range of offerings and the coffees we tried were very good. only downside is the lack of an elevator in this hotel, so if you are on an upper floor and have significant baggage, it can be a haul unless you get help. i'm a big guy and generally prefer to carry my own bags. Enjoy over all stay. The only draw back is there's no elevator (thus those with large / heavy suitcase and those with old people may need to think about this). Other than that, I love this place and will stay there again. A wonderful little guesthouse over a coffee shops. Our room was themed 'Seaside' and all of the rooms have a different theme. Excellent value for money and very helpful staff. We do not speak Thia and their English was limited, but they still managed to book us bus tickets and help us sort out our WiFi connection. Breakfast was O.K. and given the room rate a welcome free addition. The coffee shop is full of kitsch nick nacks and and serves some great coffee and smoothies. i stayed here on a recent trip and the room was clean and the staff was friendly and helpful. i speak thai, otherwise it could be a problem communicating with the staff. i had the "abf" one morning and stayed with the thai food after that. i am young, so no lift was not a problem for me, but i would not want to bring my family here with a lot of luggage, or an elderly person. since each room has a theme to it, my room did not have a chair in it, by design. i was so glad to leave and get to a place with a chair. other rooms have different decorating schemes to them, but the hotel was busy and i could not switch rooms. I had a nice stay at this hotel. I also enjoyed their breakfast. Good coffee. Deal. Near airport. The hotel is good for only overnight stay. I couldn't sleep well because it is close to the road and the bed is not good. The price is deal with good coffee and breakfast.